Dr. Mehdi Khazali was among dozens of people arrested Tuesday night in a raid of the Pen Society meeting, was moved to Ward 209 of Evin prison and has launched a dry hunger strike. The majority of people arrested last night have already been released on personal guarantee, but the civil and political activists remain detained. Newly released Dr. Ghasem Shole Saadi was also among those arrested, but there is no information regarding his status, and there is the possibility that he has also been transferred to Evin. 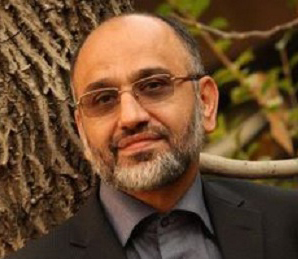 Dr. Khazali, an Ophthalmologist, author and regime critic, has been arrested six times before. On his last arrest he launched a hunger strike that lasted more than seventy days. On his last hunger strike, Dr. Khazali lost more than 65 lbs and lost so much strength and was so frail that he had to use a cane to walk. Dr. Khazali, an Iran-Iraq war veteran, launched a hunger strike from the first day of his arrest in 2011, protesting his illegal and violent arrest. That arrest involved so much violence by the Intelligence Ministry’s agents that he suffered a broken arm, broken teeth and injured leg. During his last incarceration, his health deteriorated and became dire. He suffered a heart attack and was hospitalized in the CCU section of Taleghani hospital due to complications from being on a hunger strike. Dr. Khazali had predicted this latest arrest and an entry on his personal blog was posted this morning. Some days ago, the threats started again, the groundless conspiracies, but I do not and will not recognize these injustices. I object to these proceedings and will launch a hunger strike. I will close my mouth to food and water. I want meet my Beloved with dry lips and drink from the hands of the cup bearer of paradise, just as did my Lord, the Exalted Imam Hossein, peace be upon him. With the hopes that with the giving my life I will make the Yazids more ignominious (Imam Hossein was killed by Yazid in the battle of Karbela). I am of the belief that all political prisoners should go on hunger strike to put an end to the oppression and to uproot this injustice from it’s foundations. I consider hunger strike as a form of struggle and civil disobedience, and consider hunger strike and the sacrificing of our lives as the last weapon of the oppressed in a world that does not hear our voice. Of course, my last release from prison was on the direct order of the Supreme Leader, and my arrest on violations of that order can only be possible by his direct order. Not only in Islam, but even the Pagans would never withdraw their mercy. I will launch a hunger strike from day one, and sincerely ask for forgiveness from all the loved ones and friends. In an ongoing effort by the Intelligence Ministry to create problems and harassment of the political prisoners, they have stationed one their interrogators named Abbasi in Ward 350 of Evin prison. They have also transferred a number of people convicted of spying for the CIA and Mossad to section 350 in an effort to use them against the political prisoners. According to a Kalameh reporter, Intelligence Ministry’s representative has promised these people that, in return for spying on the political prisoners and giving information about them and creating trouble in the ward, they will reward them with telephone access, face-to-face visitation with their families, furlough, reduction in their prison terms and pardons. Due to their own situations, these prisoners are willing to do whatever is necessary to help their own cases, and have created problems for the political prisoners. It should be noted that the Bureau of Prisons and the Judiciary are responsible for, and hold jurisdiction over the prisoners serving their sentences and the Intelligence Ministry and the IRGC legally do not have the authority to interfere in their affairs. However, in reality, in recent years the interrogators have reigned over the Judiciary and the Judges. According to the families of some of the political prisoners, in a recent visit to ward 350 by the Bureau of Prison inspector, the political prisoners voiced their outrage over the interference by the Intelligence Ministry and complained about the stationing of an agent from Ward 209 (under jurisdiction of the Intelligence Ministry) in ward 350. According to reports, the inspectors from the Bureau of Prisons had no knowledge of these events, which shows that they are not able to do anything regarding this matter. Following is translation of an interview conducted by Fereshteh Ghazi of Roozonline with Mir Hossein Mousavi’s sister and brother-in-law. Mir Hossein Mousavi in ​​a meeting with members of his family told them: I am still Green and standing behind the Greens. This was told to Rooz by Mir Hassan Habibi Mousavi husband of Mir Hossein Mousavi’s sister. Last week on Wednesday Kalameh site reported that Zahra Rahnavard’s parents and sister, and family of martyr Ali Mousavi (Mir Hossein Mousavi’s nephew) were allowed to meet with Mousavi and his wife. According to Mousavi’s sister this meeting took place at Mir Hossein Mousavi’s residence on Akhtar alley. I asked about the health of Mir Hossein Mousavi considering his heart condition for which he was hospitalized a short while ago. Mrs Mousavi said, “He is doing fine, and is under the supervision of a physician and a medical team. All in all, their condition is satisfactory and both Mir Hossein and his wife Zahra are in high spirits. According to the Kalameh website, during that meeting, Mousavi had voiced concern regarding the difficult economic situation that the people are under. She ads, “He holds the same position as he did prior to his house arrest and holds steadfast on the rights of the people and has not changed in this regard. 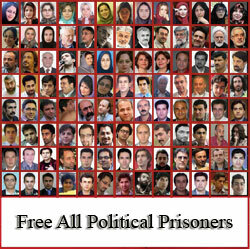 Mir Hossein Mousavi and his wife Zahra Rahnavard have been under house arrest since February 14, 2010. Despite all the charges and accusations made against them by Mahmoud Ahmadinejad and the Supreme Leader Ayatollah Khamenei, they have not been formally charged or tried for any of these accusations. So far, none of the officials of the Islamic Republic have claimed responsibility for the house arrest of Mir Hossein Mousavi, Zahra Rahnavard and Mr. Karoubi. Previously the Kalameh website had reported on the pressures put on Mousavi’s family and the threats of arrest made against his daughters. They had reported on the Intelligence agents making threats on their lives and their jobs, and had told Mousavi’s daughters, that they would arrest them and take them to a prison or an undisclosed location so no one could hear any news about them. Mir Hossein Mousavi’s sister, Mrs. Mousavi Khamene, lost one of her sons during the Iran-Iraq war and her other son during the mass street protests of Ashura (December 2009). Her son, Sayd Ali Mousavi was gunned down by men riding in a black SUV and later died in Sina hospital. Previously, in an interview with Rooz, Mrs. Mousavi said, “The people were not armed (The people who were protesting on Ashura). They (the officials) very well know who the assassins are, and what their preconceived motives were and had methodically chosen Ali to be killed. Everyone knows that this murder was an assassination, intended to put pressure on Mir Hossein Mousavi. Does Islam say to tolerate injustice and remain silent? Not so; Islam does not say to accept injustice. Mr. Mousavi also could not tolerate injustice. He has not done anything wrong, but like the other people had objections. We also have objections and do not accept remaining silent in the face of injustice. Following the summoning of Sayd Ahmad Ronaghi,(father of Hossein Ronaghi Maleki) to the Intelligence Ministry in Tabriz, this political prisoner’s family received the threat that, if Hossein’s brother and sister continue to be active on Facebook or other social networks, they will be arrested. According to reports by Kalameh, the intelligence ministry’s interrogators have also threatened and warned the family to not provide information about Hossein’s case to the media. Previously, Hossein’s mother had told Kalameh that the interrogators threatened to arrest her daughters if she gives press interviews. According to Hossein’s family, he has informed the Judiciary officials that, if they continue to deny his right to medical furlough, and if the Judiciary continues to keep the earthquake aid workers incarcerated, he will launch a hunger strike. Despite dire and deteriorating health of incarcerated blogger Hossein Ronaghi Maleki, Tehran’s Prosecutor General refuses to approve hospitalization. Hossein Ronaghi Maleki, a human rights activist and blogger active in developing anti-filtering software was arrested December of 2009. Hossein suffered kidney damage in prison due to torture. He has lost 90% functionality in one kidney and 80% loss of functionality in the other kidney. Hossein has had seven kidney operations while incarcerated..
Hossein was violently arrested and suffered beatings at the hands of the arresting agents. He was hit and kicked in his kidneys by the arresting agents causing more damage to his already damaged kidneys. While in Tabriz prison, he suffered bleeding from his kidneys but was not provided medical treatment, and was transferred to Evin prison in dire health, where he is still deprived of medical treatment. According to latest reports received by HRANA, Hossein is currently suffering from pain and infected kidneys. In addition to pain and burning sensations during urination, blood clots also now appear in his urine. The pain in his kidneys that started after his arrest in Sarand has now intensified and he is suffering from swelling of the face and body. Despite the IRGC’s approval for Hossein to be transferred to a hospital for proper treatment, to this date, Tehran’s Prosecutor General has refused to approve the transfer, putting Hossein’s life if serious danger. Former Allameh Tabatabaei University student activist, Nasim Soltan Beigi reported to Evin on Saturday to start serving her three years prison term. Nasim Soltan Beigi was sentenced to six years imprisonment by Branch 15 of the Revolutionary Court. Her sentence included: 3 years on charges of “Anti-national Security Acts”, one year for “Propagating Against The Regime”, and a 2-year suspended term for a case filed against her in 1987. Upon appeals, her case was sent to the Court of Appeals for review. Prior to her last arrest, Nasim was arrested in 2007 and later released on a 50 Million Toman bail. Previous to that, she was arrested in 2006 during a women’s rights activists’ protest. This arrest resulted in a two year suspended prison sentence. Soltan Baigi had worked as an environmental and urban reporter for various newspapers and publications, such as Sabz Press, Shargh and Arman. “And the earth spun until finally it stopped at the point where Evin is….the bells rang again, the doors were knocked and the summons arrived…..it’s time to depart, and the clamor of moments are a relentless call of readiness….these are strange times my darling…..times that even the insiders are being imprisoned, much less for us outsiders…. These days even the sky is in a turmoil….and disasters relentlessly occur one after another….and it was during one of these storms that finally the bells also rang for me…..the bells that I had been awaiting for sometime now…I must go….I must go for the third time….I don’t know how long those thick walls and doors will be my host and the host of many others like me…but what was in our voices that we must be enchained this way? Darkness may naively believe that it has the power to enchain Freedom…..my crime is believing….believing that in a humane world the wolves are not human….my crime is counting the days till we achieve this realm of humanity…. These days I continuously murmur to myself…..I….I have a dream…a dream of Freedom….the dream of a continuous dance of joy…I have a dream….a dream of awakening kind….a dream of soothing this recurring pain…..the pain of the world that is being stripped of Love…the pain of a tree that is drying from it’s roots….the pain of women that are sentenced to torments….or the children that must labor…my dreams becoming reality is the cure for my pain…..the cure for these pains is the world that I long for….